Episode Review: LEVERAGE, "The Low Low Price Job"
Leverage returned with the second part of Season 5, and while it was nice to have the Crew back together "The Low Low Price Job" was far from the show's strongest episode. At the pub, Eliot came across a young woman who was clearly down on her luck. After talking to Tabitha, he learned that a big box store called Value More was moving into her small town and affecting all of the local businesses because it had the backing of the city and not of the citizens. For some reason Eliot was determined to help save Apple Springs from the corporate giant in spite of some initial hesitations from the rest of the Crew. Nate's had his eye on Value More for sometime due to its shady dealings and poor employee policies, but he knew they couldn't take down an entire corporation so they fixed their sights on the one store. They tried a three-tiered approach to closing the newest Value More branch: toxic land, unionization and bad luck. Unfortunately for them, the executive in charge of the branch's opening, Caroline Cowan, was able to side-step every one of their cons. Eventually, Nate decided to have her hang herself by making her think that she had gotten sick from the "toxic land" thus causing her to have an outburst in front of her boss and the store's employees. Value More was done in Apple Springs after her meltdown. During all of this, Eliot was undercover as a Value More employee who was responsible for starting up the unionization talk but he also ended up befriending an old-timer named Martin. He used to own a mom-and-pop hardware store but decided to close up shop since he couldn't compete with newest behemoth. Martin's story reminded Eliot of his own upbringing, which conjured up raw emotions since his father was disappointed that he decided to enlist in the military instead of taking over the family business. After the dust settled and Value More was ousted, Eliot made things right by getting Martin a job at Tabitha's market. He even asked her out on a date, but he needed to mend his relationship with his father first. He headed back to Oklahoma and walked up to his old home but no one was there to greet him. 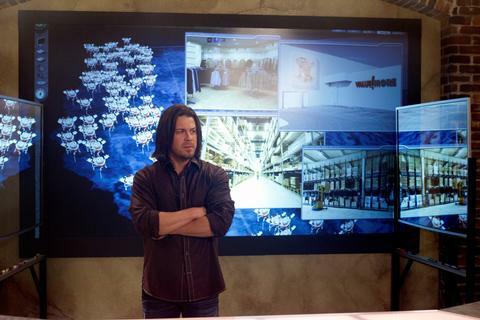 The success of a show like Leverage hinges on its stories and its characters. Story wise, this episode just didn't work in my opinion because it was dripping with saccharine and overly treacly, and matters where not helped by the fact that the mark-of-the-week was way too cartoonish. Admittedly, I'm not familiar with small town living, and I understand that local businesses are important to these kind of communities, but "Low Low Price" doubled down on the Rockwell-esque notion of that kind of living and adding an evil corporation out to get the little guy component didn't quite work because it all came off as manipulative and hollow. As for Caroline, I was put the second she walked around town ticking off all of the businesses that she was going to crush. She was so much of a cliché that the only thing missing was a mustache for her to twirl. To be fair, most of the baddies on Leverage don't stray too far from big business stereotypes, but the way this character was calibrated was off-putting and not in a I hope for her comeuppance kind of way. Thankfully, Eliot single-handedly saved this episode. For most of the show's run, Eliot's been the most enigmatic character because he's the one who know the least about, but Leverage has done of good job over the last couple of seasons at fleshing him out and making him more than a ruthless hitter. We all knew about his homegrown roots, so it made sense that he'd the most passionate about saving a small town from Value Mart, but that added layer of his fractured relationship with his father gave us a glimpse into how he became the person that he is today and made him far more interesting. And that final shot of him standing on the porch all alone was brilliant. Good stuff from Christian Kane. I was glad that Hardison was pro-Value More at the beginning because I'm sure his thoughts mirror those of a lot of people out there. Sure, these kind of stores might be evil but the everyday consumer doesn't know that. Parker's need to have her arm around Hardison was distracting. I got that it was supposed to be "cute," but I couldn't help but feel for the guy. I know that Value More was supposed to be a stand-in for Wal-Mart or Costco, but those green polos just screamed Buy More. Hardison and Eliot are the still the best bromance on television. "Hey man, when in Portland you gotta do as the hippies do." "Too big? We overthrew a government in a foreign country." In all reality, "The Low Low Price Job" probably wasn't as bad as I'm making out to be, but I couldn't help but be disappointed by it. The lazy villain and an the over plucking of heartstrings were too much to overlook, but at least a strong outing from Eliot kept me engaged throughout.